Yesterday, Monday. Supposed to be grocery shopping day for me, relax day for her and it ended up a relax day for both of us. I live by rigid schedules and almost never deviate drastically but we ended up watching THREE movies (Ruthless People, The Great Outdoors, and Star Trek III) and ordering delivery pizza for dinner which we ate on the couch while we watched a movie! This is unheard of. I insist on cloth napkins, stemmed glasses only, no phones, soft music, etc. pretty much every family dinner. This morning, we had our morning devotions, which ran late so it was about 10am when we really got motivated and decided to start making productive things happen. That’s when we noticed the water was off. And there was a crew down the street, about to tear the street up. I walked over and they said it would be 6 to 8 hours. I went home and told Terra and we were then really wishing we’d at least had the motivation to have taken showers yesterday! But the grocery shopping couldn’t wait another day so we went as we were. Yikes. Of course, we had no idea if I’d even be able to cook (I usually start around 3, we eat at 5). Also, I had some catch-up house cleaning I had planned to do but that was out because of not having water to clean with. So, it was a long day. A voluntary unproductive day followed by an involuntary one. But, the good news is they got it back on right at 3 so I was able to cook. 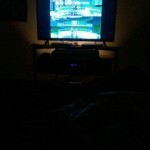 In the evening after dinner, Terra started a new game – Skies of Arcadia on Gamecube in our bedroom. I finished the Dreamcast version back in the day and absolutely loved it. And I played Bioshock Infinite while Wesley cheered me on. We’re both loving this game and look forward to our weekly 2 or 3 hours with it. But, wow, there is a lot of catch up to do tomorrow. Again. This entry was posted in daily recap and tagged gaming, house husband, watched movie, xian by ABQChristopher.Bookmark the permalink.